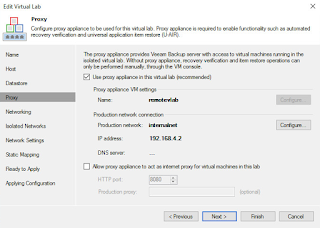 If you want a to setup a Surebackup job, the most difficult part is setting up the virtual lab. 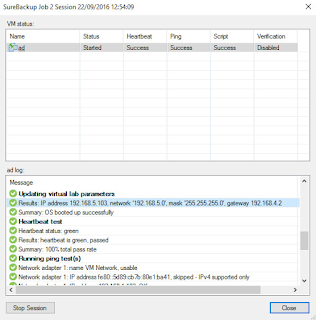 In the past, great articles have been written about how you need to set them up but a common challenge is that the backup server and the virtual lab router have to be in the same network. In this article, I wanted to take the time to write out a small experiment I made the other day, to see if I could easily get around this. This question pops up once in a while, and now at least I can tell that it is possible. 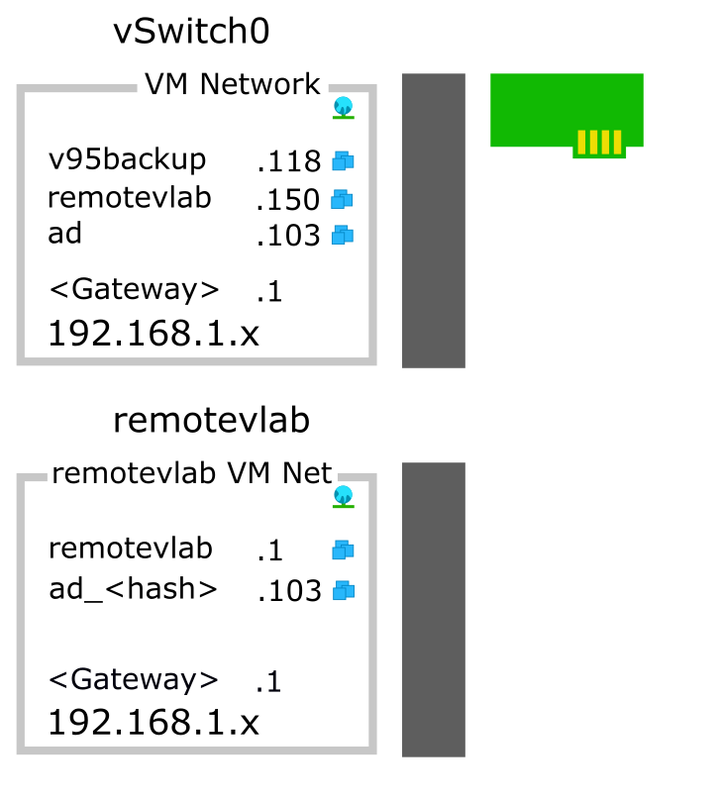 In this example, the virtual lab is called "remotelab". A linux appliance has been made, called "remotevlab" which sits in the same network as the backup server. It routes requests from the backupserver to a bubble network called remotevlab VM Network. This mimics the production range and reuses the same range. To allow you to communicate with the segment, the appliance uses Masquerading. In my example, I used a mask of 192.168.5.x, so if I want to access the ad, I can contact 192.168.5.103, and the router translates that 192.168.1.103, when the package passes. 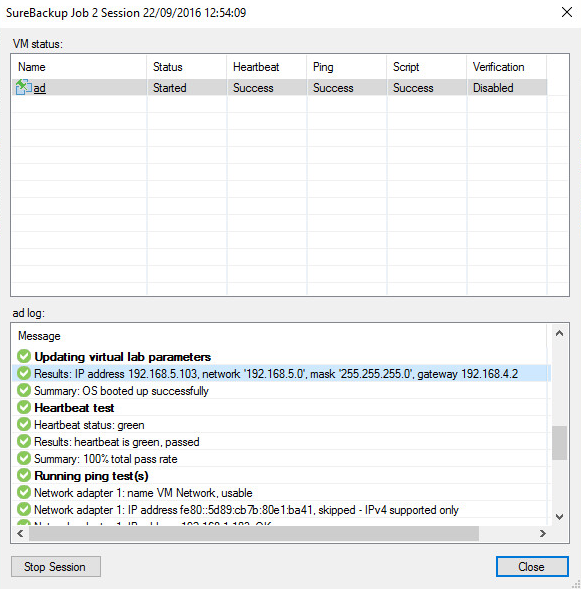 For those who have already setup virtual labs, this is probably not rocket science. 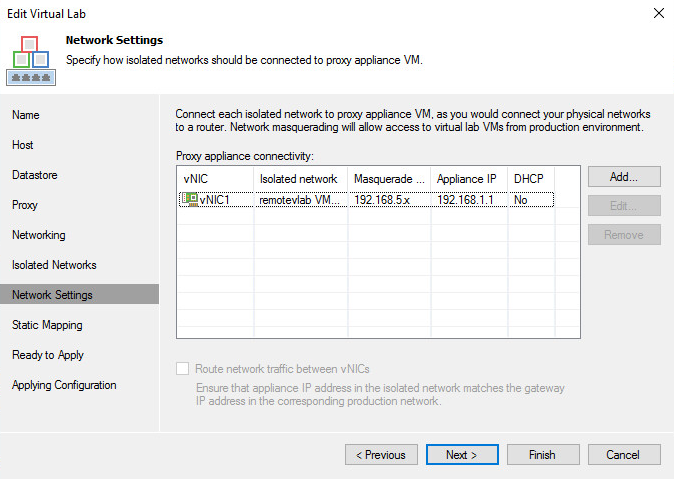 However for this scheme to work, the backup server needs to be aware that it should push IP packages for the 192.168.5.x range to the remotevlab router. 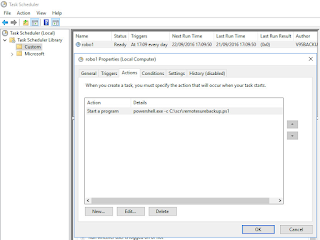 So when you start a Surebackup Job, it automatically creates a static route on the backup server. When the backup server and the remotevlab router are in the same production network, all is good. In my small home lab, I don't really have 2 locations connected via MPLS or different routers. So to emulate it, I created an internalnet which is not connected with a physical NIC. 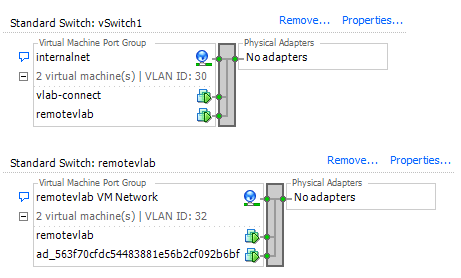 I connected the remotevlab there (the production side of the virtual lab router). In this network, I use a small range called "192.168.4.x". The first thing we need to do is download PPTPD. It is actually hosted in the EPEL repository, so you might need to add those repositories, if you have not done that yet. Next step is to make a client login. By default it uses a plaintext password. Again, since it is not really about security (not trying to build tunnels over the internet here), that is quite ok. You set them up in /etc/ppp/chap-secrets. "surebackup" is the login, "allyourbase" the password. 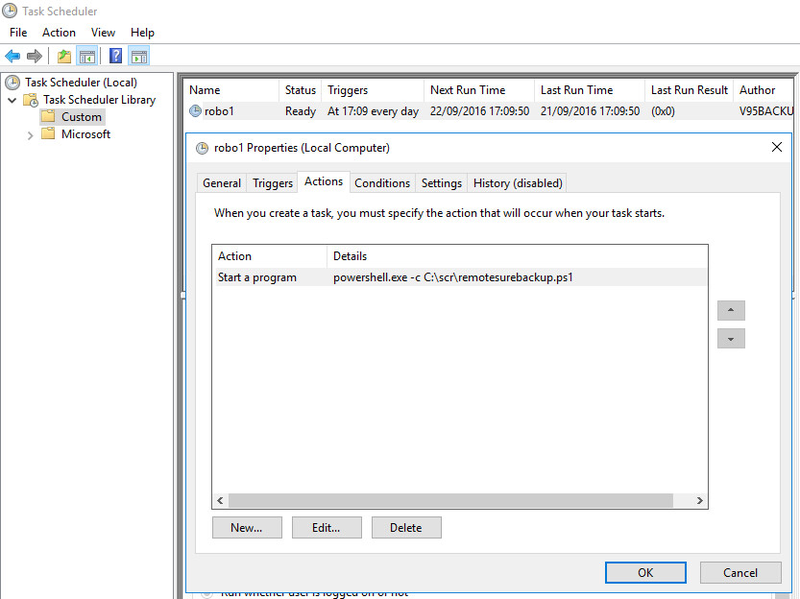 PPTPD is just the default configuration name. * means that everybody can use this. So if you want, you can still add a bit of security by specifing only the backup servers IP. 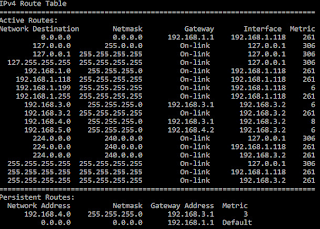 I did not add the DNS config to /etc/ppp/options.pptpd as we don't really need it. So now the only thing left to do is to start the service and configure it to boot at power on. With the server being done, we can now head over to the backup server. You can just add a new VPN and put it to PPTP. 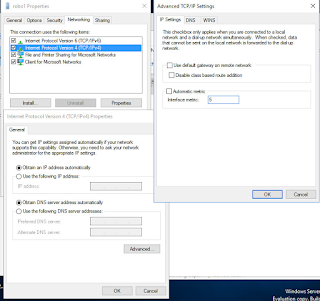 In the adapter settings > networking tab > ipv4 > advanced, uncheck "use default gateway". I also put the automatic metric off, and gave in the number 5. Now because, you disabled the default gateway, the Backup server does not use this connection anymore except for the "192.168.3.x" range. So it will no longer to talk to the vlab router. 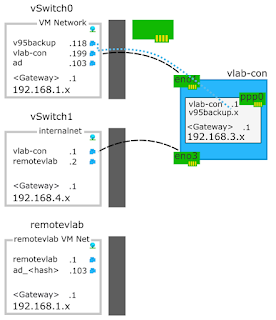 To fix it, add a persistent route, so that you can discover the remotevlab router. It should be straight forward, except "if 24". Basically, this says, route it over interface 24, which in this example was the robo1 interface, as shown below (using "route print" to discover your number). You can see a strange scheduling time, that is because I configured the tasks 10min later, and then restarted the backup server, just to see if it would work if nobody is logged in. Very importantly, like with other tasks, make sure that you have the correct right to start the vsbjob. I configured the task to have administrator rights. 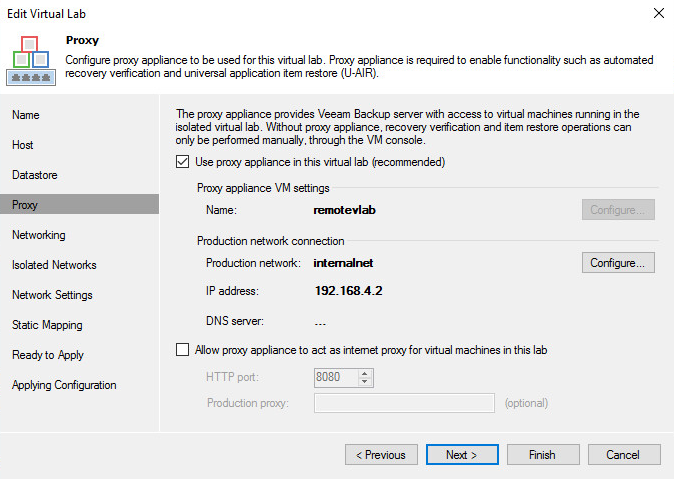 The Virtual Lab Configuration. You can see that it is connected to the internalnet. 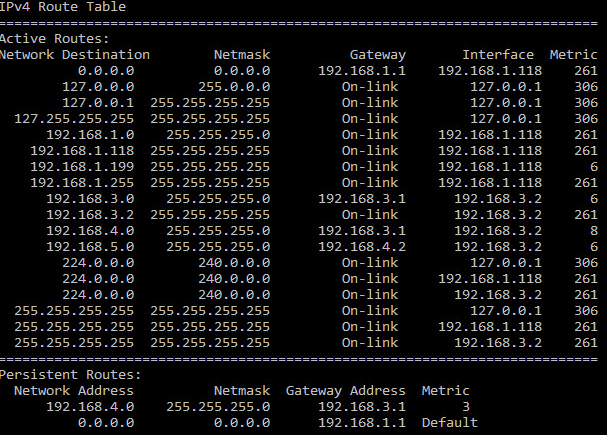 Very important is that you point to the connection broker (192.168.4.1) as the default gateway. The lab setup works and setup is relatively easy. If you made an OVF or Livecd of the setup, it would pretty easy to duplicate this setup if you have multiple locations. You might need to consider smaller IP ranges. 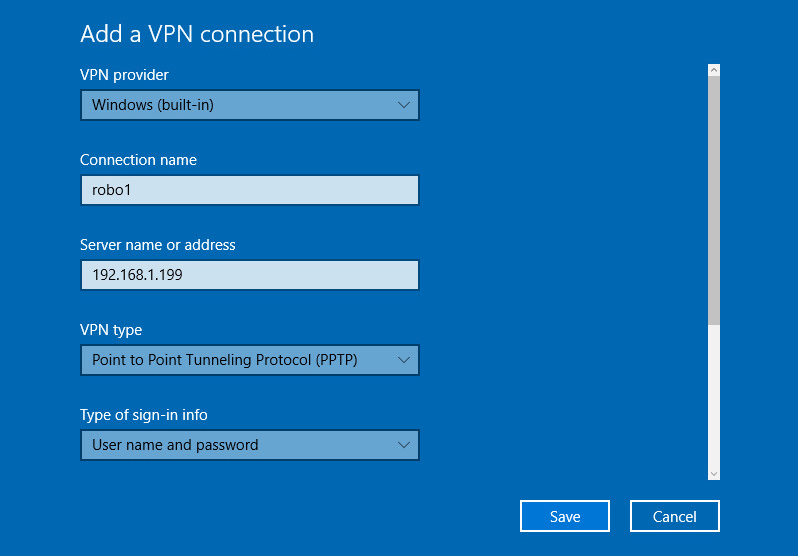 PPTP might not be the best protocol, so other VPN solutions might be considered. 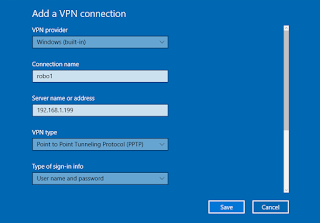 For example, you might remove another subnet, if you could bridge the VPN port to internal network directly or if you could create a stretched layer 2 connection. However, my test was more to see what needs to be done to get this to work. What I liked the most is that it has good compatibility between Windows and Linux and I didn't need to setup special software on the backup server. 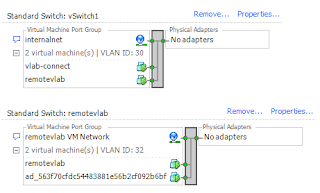 One other use case is that you could also allow other laptops in the network to access the virtual lab for testing. 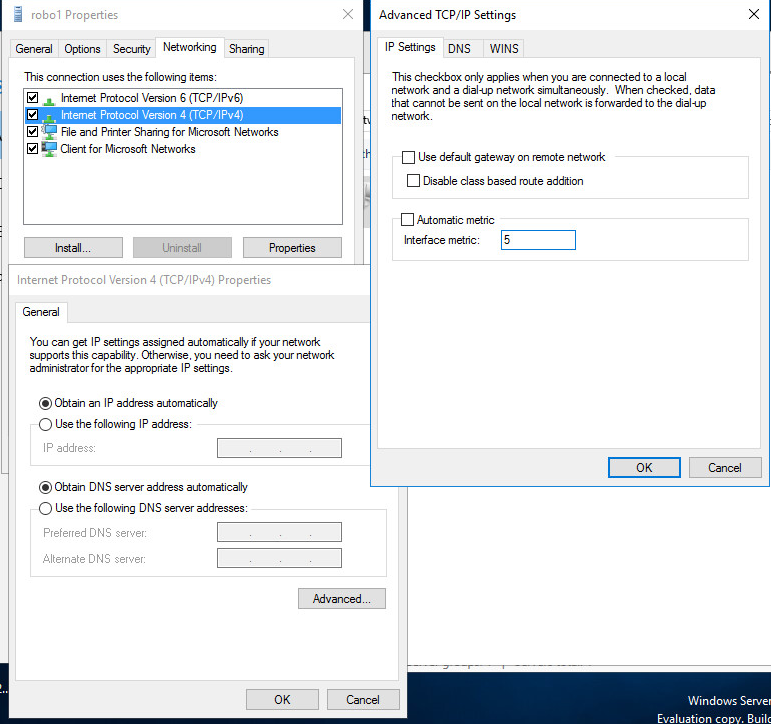 If they don't really need internet (or you need to setup the correct masquerading/dns in iptables/pptp), they could just connect to the network with a predefined VPN connection in Windows, even if they are not connected to the same segment as the backup server (something those network also would really appreciate). 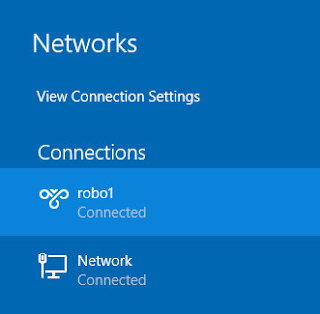 If everything is configured correctly, the setup should still work, but people that are able to connect to the connection broker can not necessarily get to the virtual lab. They first need to make the PPTP connection. Notice that, not masquerading has been setup towards the remotevlab router (as in the Archlinux doc). 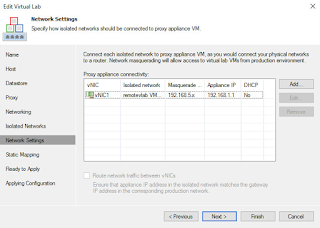 That is because the remotevlab router uses the connection broker as the default gateway, so when it replies, it will always do so redirecting the request back to the connection broker.